The first time I made sushi was at a “singles” sushi making class (uggghhhhh… don’t judge me, it sounded like a good idea at the time). There was a guy hitting on on the ladies. His name was “Mack”, according to his name tag. “Mack” was written on his name tag… in actual double quotes. Are you done laughing? Cool. There’s more to that story but 1) I don’t really know you like that and 2) it’s better heard in person. Not only did I get a couple of really good stories out of it, I also actually learned a couple of things about making sushi at home. The Fish: Look for “sashimi grade” fish. The frozen tilapia from Trader Joe’s doesn’t work here. The fresher, the better! 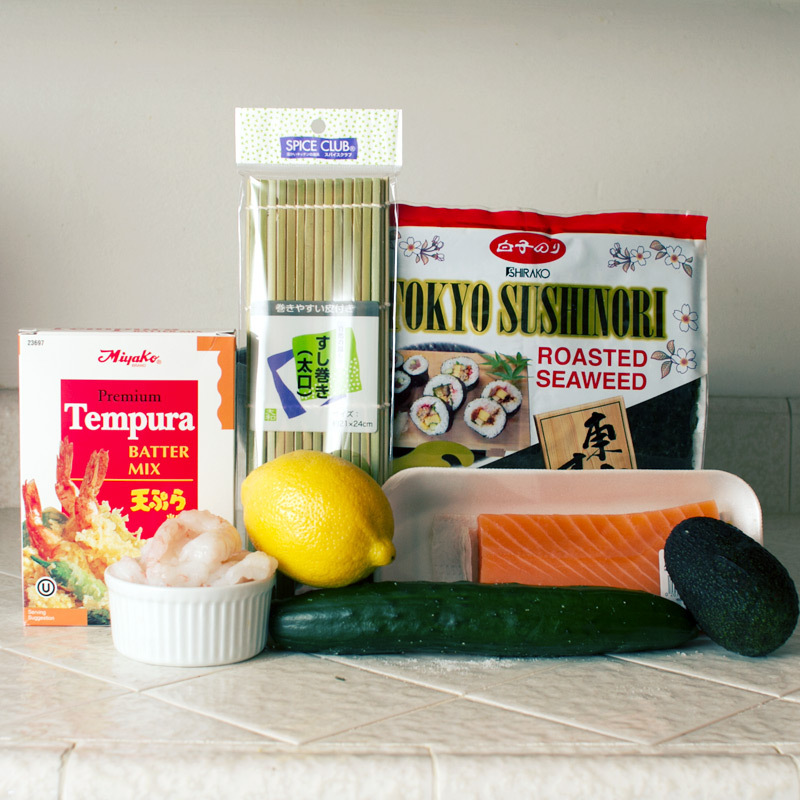 (San Diego – Whole Foods, 99 Ranch, H Mart and Zion Market, and Catalina OffShore are a few places that carry sashimi grade fish). 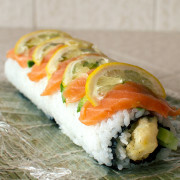 The Rice: Sushi rice is short grain rice that has been seasoned with sugar, salt and rice vinegar. The Bamboo Mat: Cover it in plastic wrap for easy clean up. 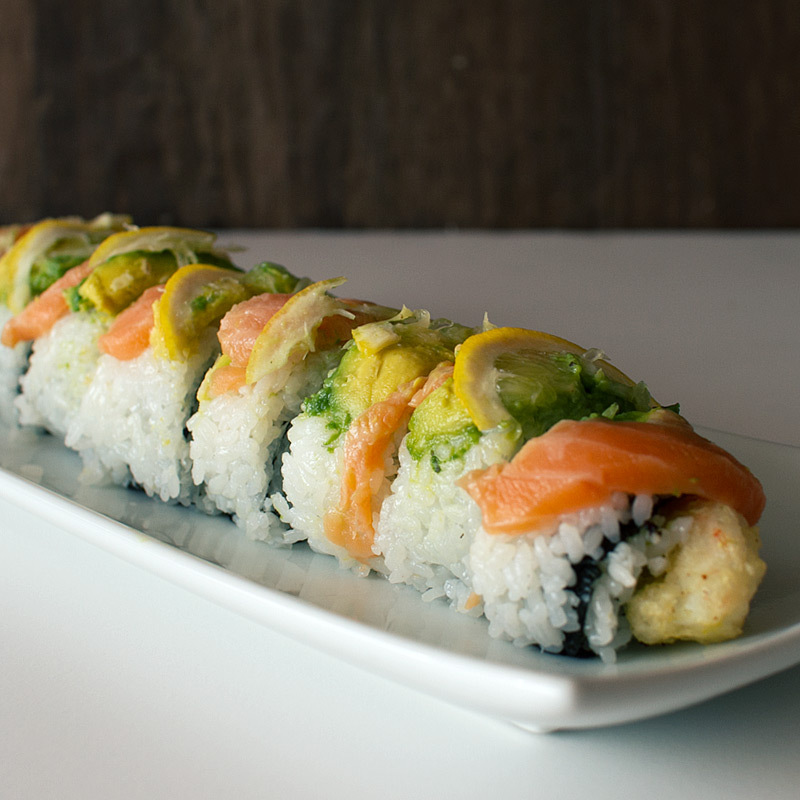 This roll is inspired by the Vitamin C roll at my go-to sushi spot, RK Sushi in Mission Hills. 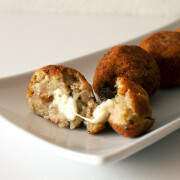 Their version uses krab (yes, with a “k”) on the inside – not my favorite. I replaced the krab with shrimp tempura. Let’s start with the rice. 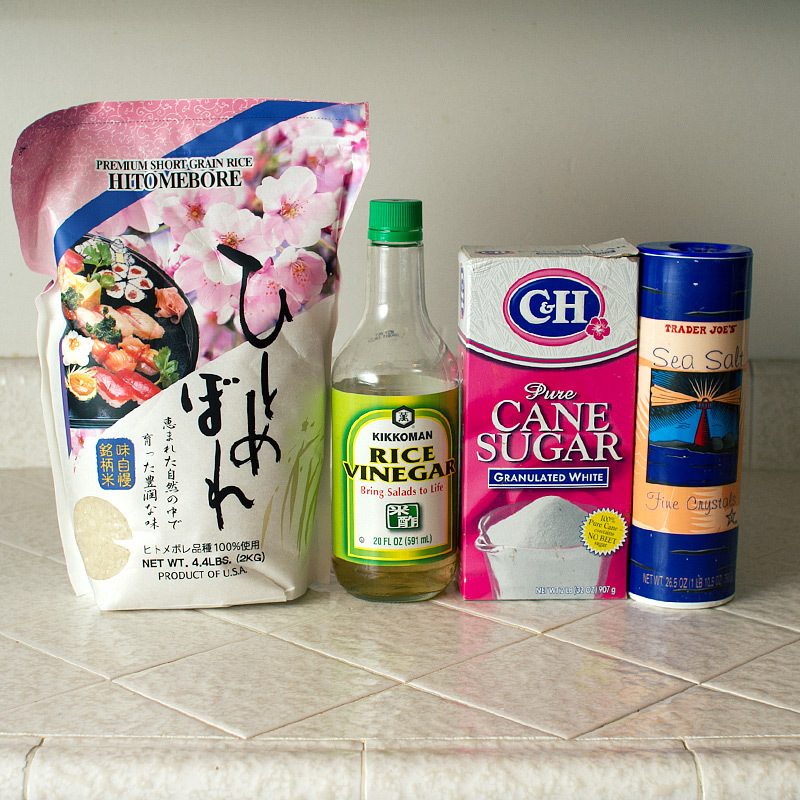 For the sushi rice, you’ll need short grain rice, rice vinegar (unseasoned), sugar and salt..
Rinse the rice 3-4 times, until the water is no longer cloudy. Cook the rice according to package directions. 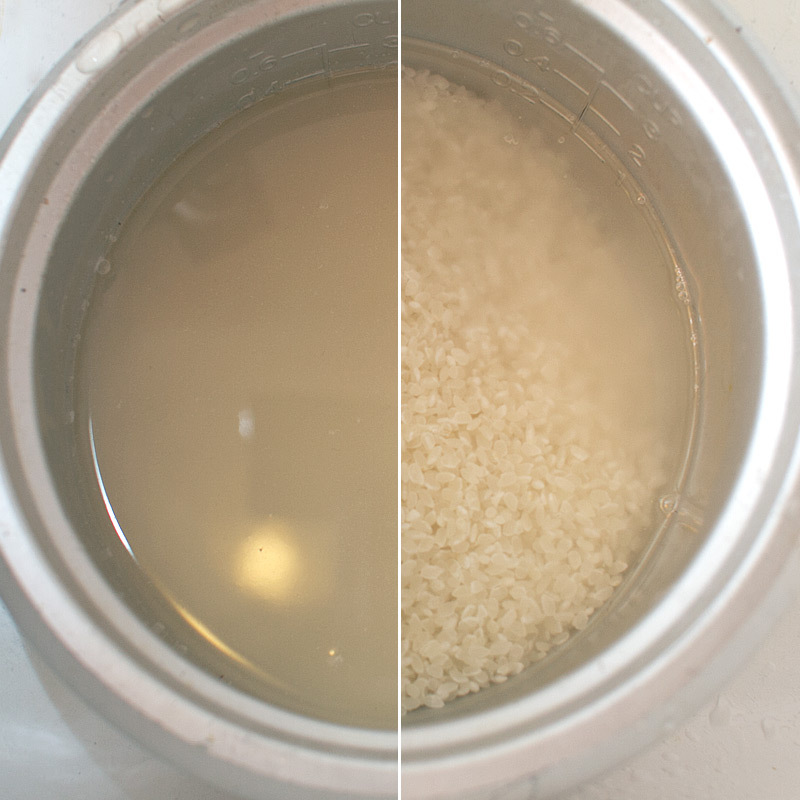 I used my rice cooker with a 1:1 ratio of water to rice. 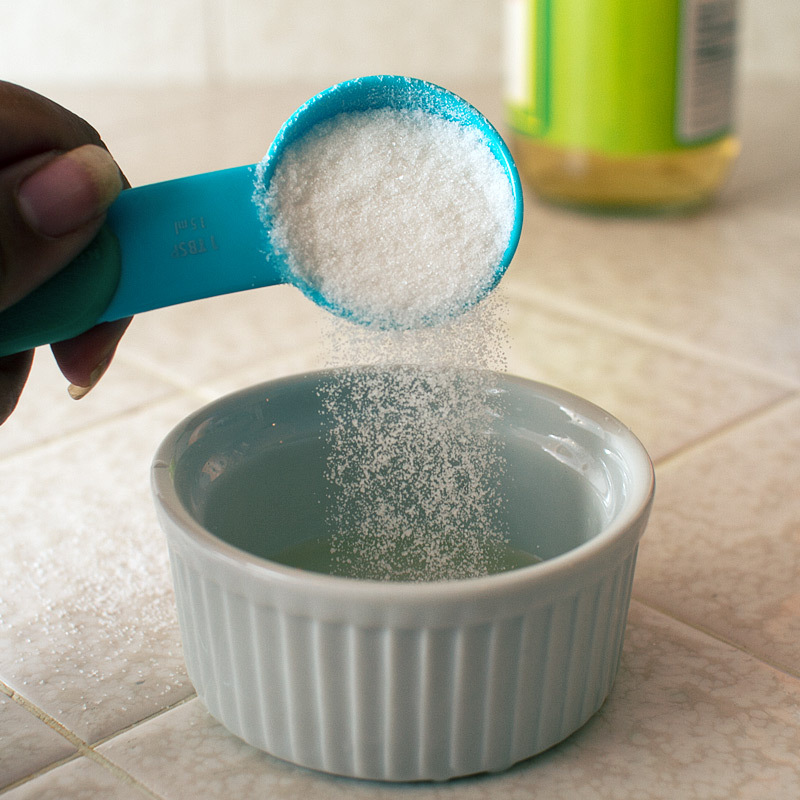 In a small bowl, combine the vinegar, sugar and salt. Microwave until the sugar is dissolved, about 30 seconds. 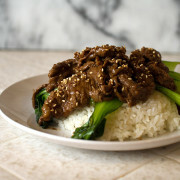 Pour the seasoned vinegar over the cooked rice and gently fold to coat all the grains. Let the rice cool while you prep the filling. 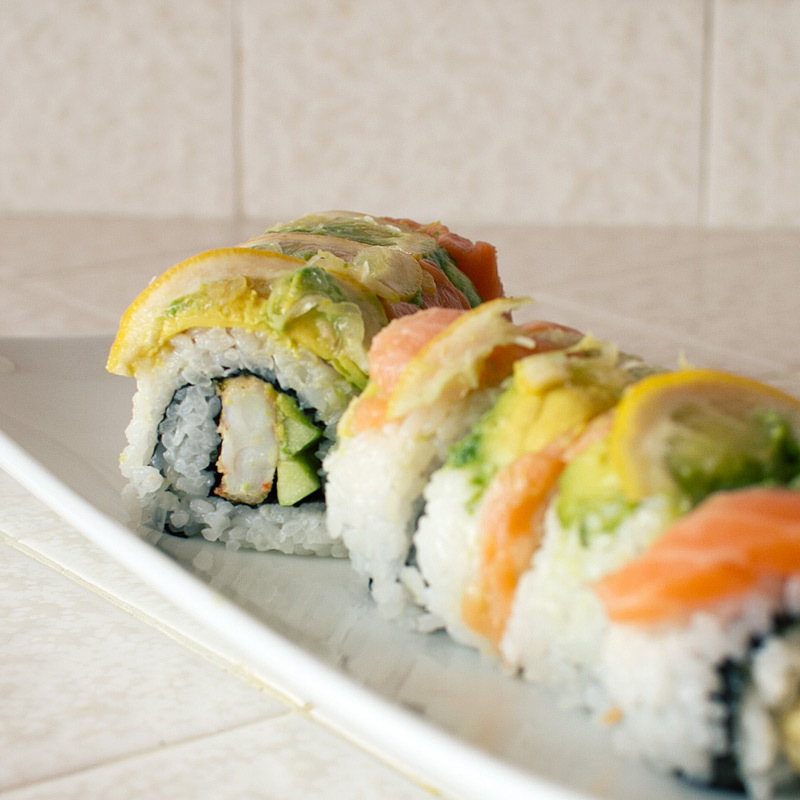 You’ll need a bamboo mat, nori, sashimi grade salmon, avocado, cucumber, lemon, shrimp and tempura batter mix. 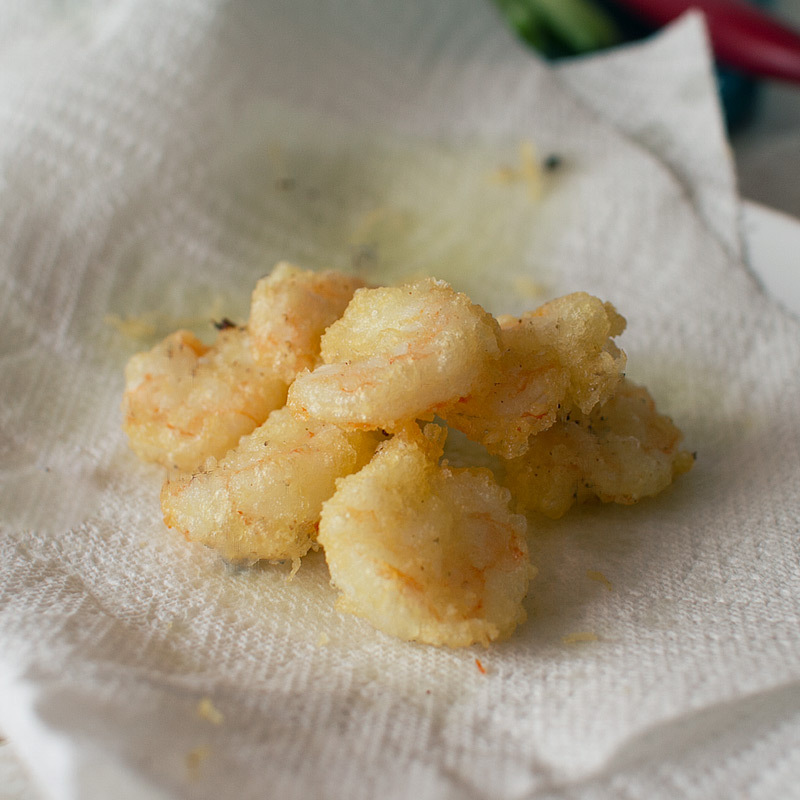 Mix enough tempura batter for 12 shrimp, about 1/2-3/4 cup of mix. Fry shrimp in about 1″ of oil until golden and crispy, about 5 minutes. 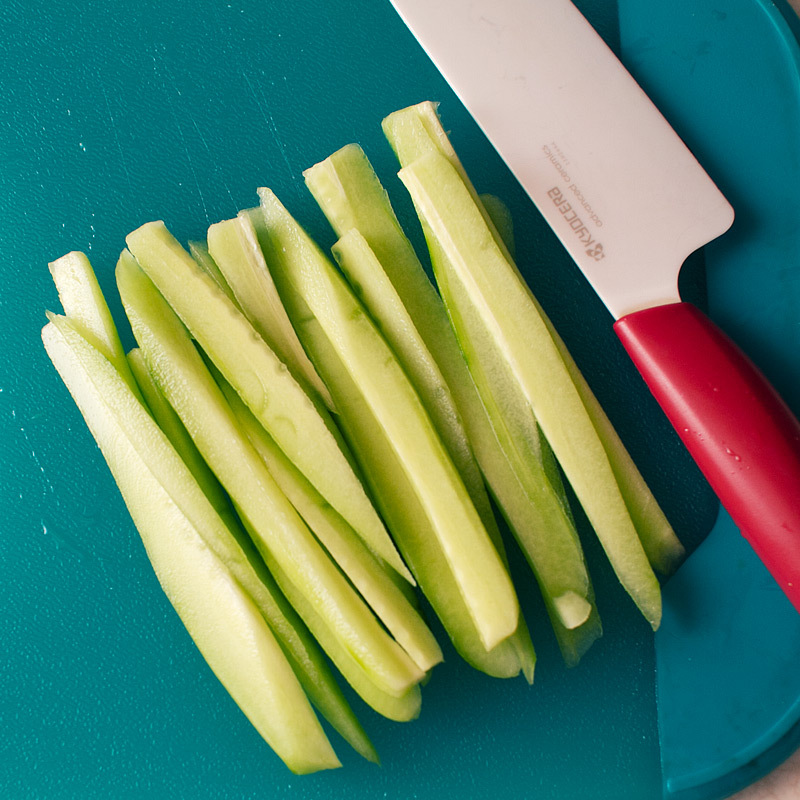 Peel and cut the cucumber into thin strips. 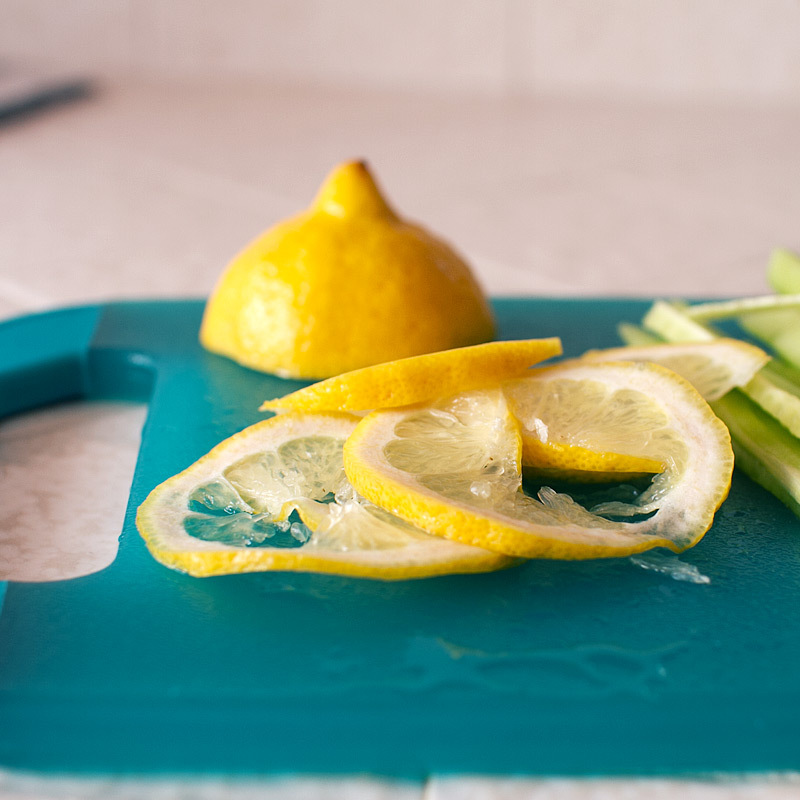 Cut the lemon into half moons as thinly as you can, removing any seeds. 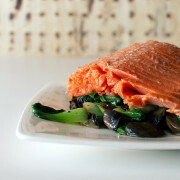 You have to use high quality fish for it to be consumed raw – look for “sashimi grade” salmon. 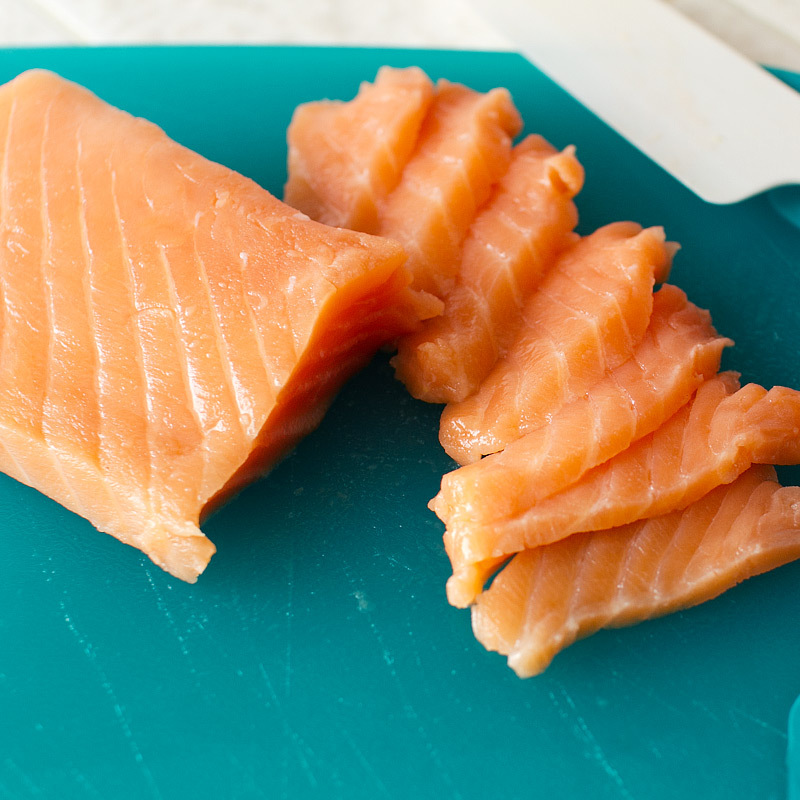 Slice the salmon thinly. Keep chilled until ready to use. Cover the bamboo mat in plastic wrap for easy clean up. Place a sheet of nori down on the mat. Using slightly damp fingers, press 1/2 of the sushi rice onto the nori. Flip over the nori so the rice is on bottom. 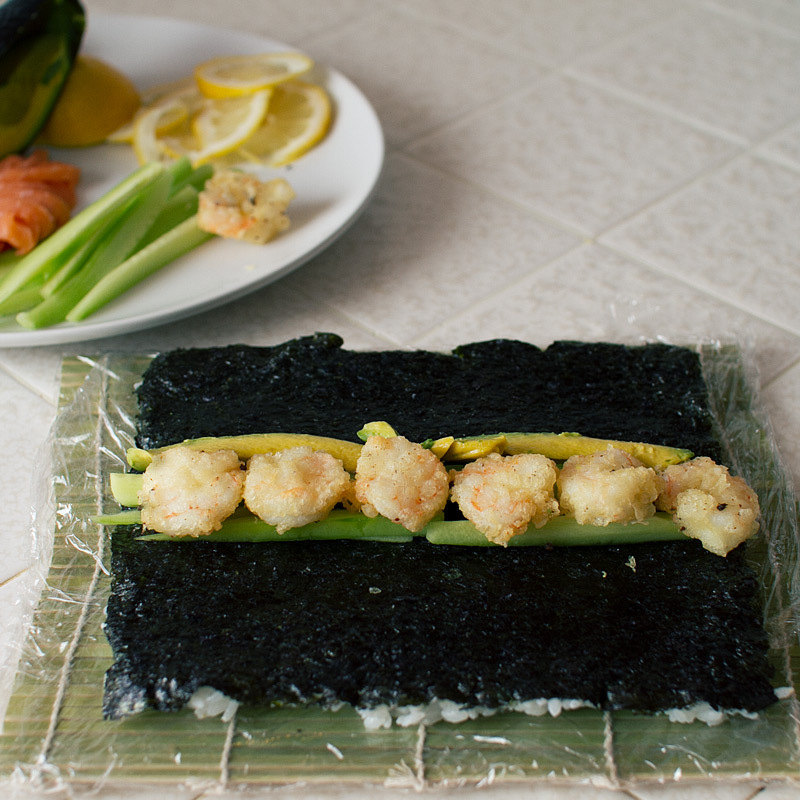 Place a few strips of cucumber, some sliced avocado and 6 shrimp on top of the nori, about 1″ from the bottom edge closest to you. This filling is too close to the middle but it still came out aight. … tuck and roll. tuck and roll. keep it right keep it tight… you don’t want the filling to fall out when you cut into it. Ta-da! Look! 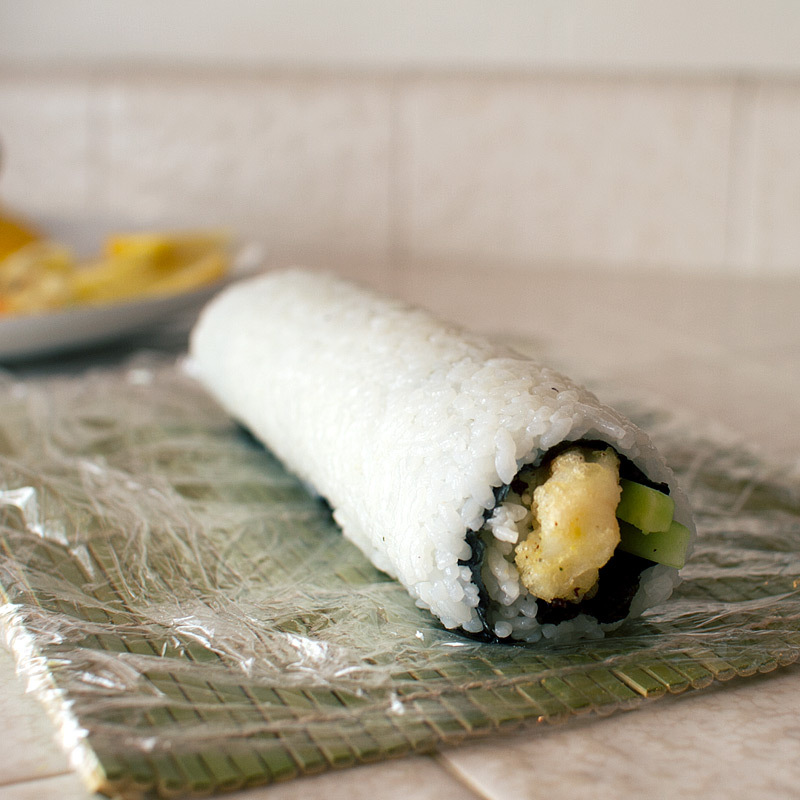 We made sushi! 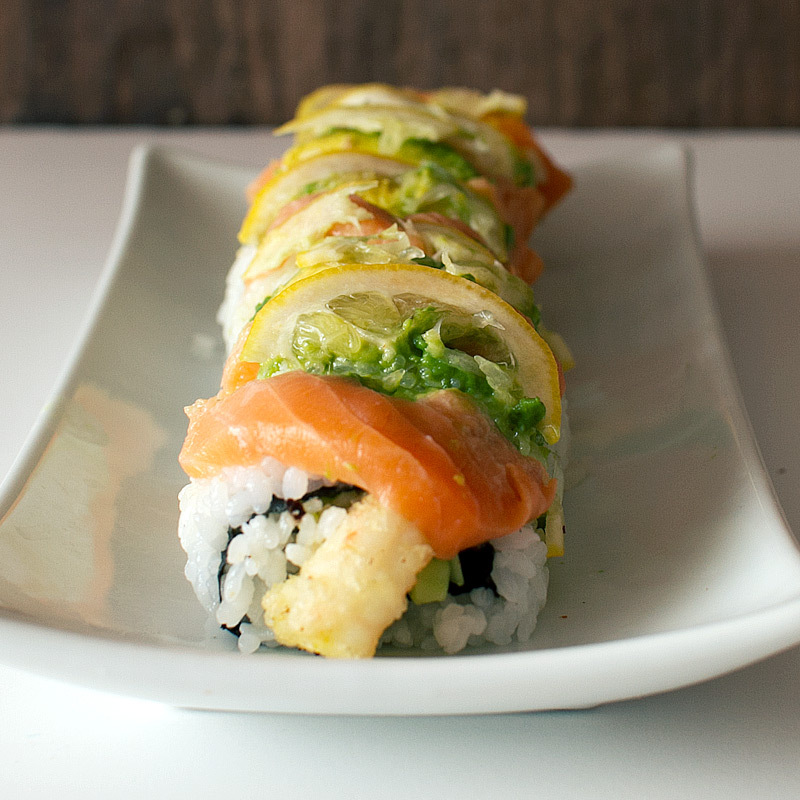 Top with slices of salmon and avocado. 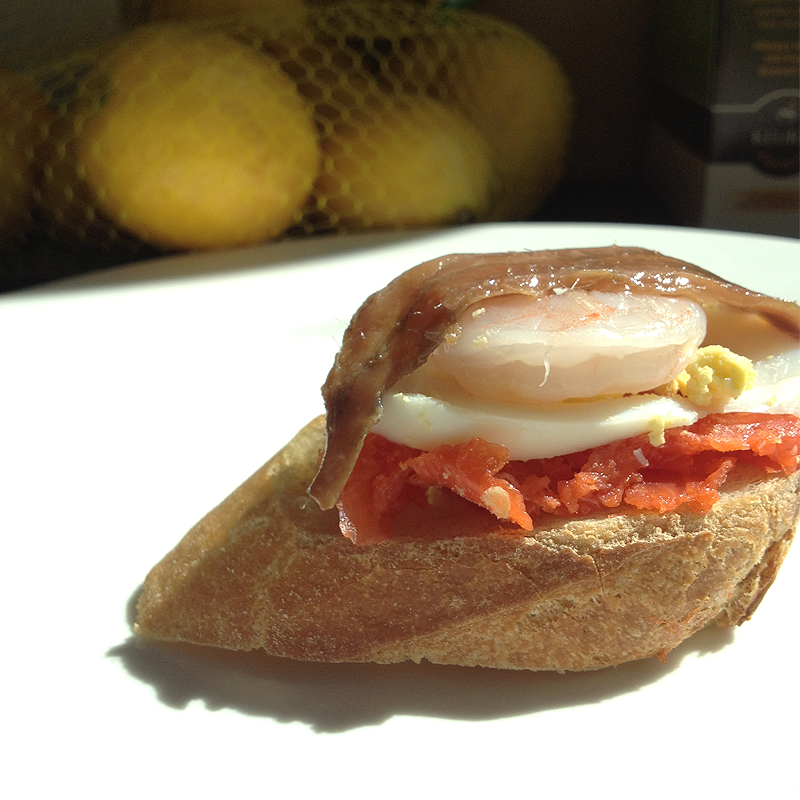 Add the thin slices of lemon. Using a sharp knife, cut into 8 equal pieces. Serve with some wasabi and soy sauce. My slices got a little janky but that’s okay. It was delicious. Cook the rice according to package instructions. 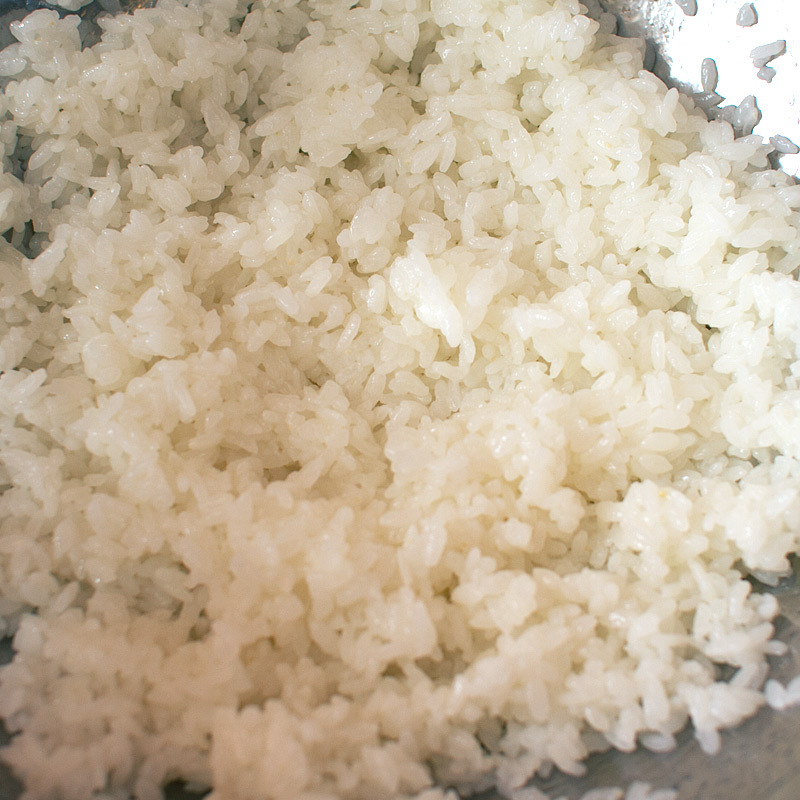 The usual ratio of rice to water for short-grain rice cooked in a rice cooker is 1:1. 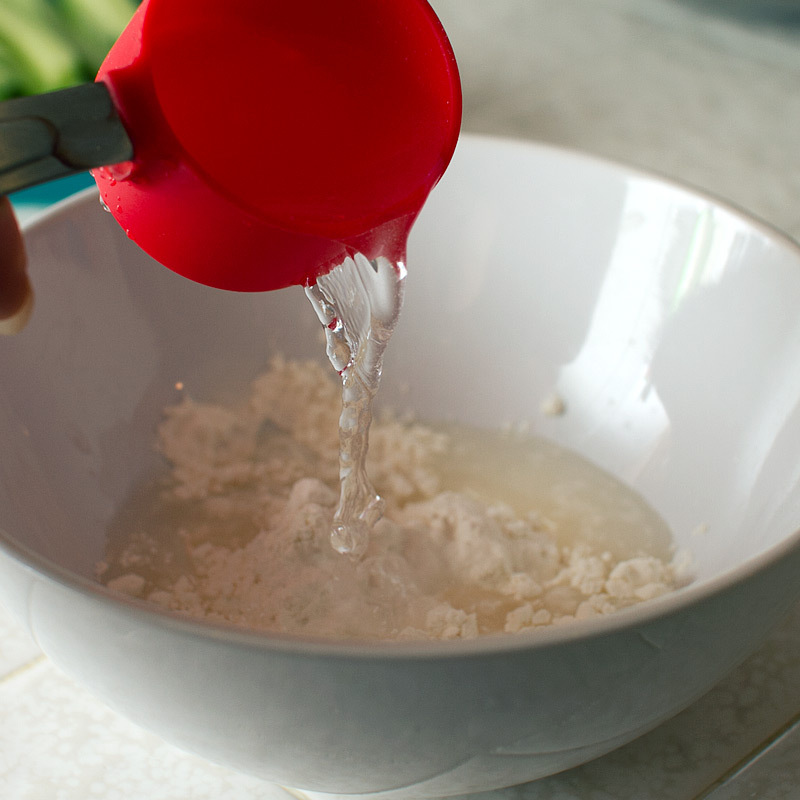 In a small bowl, combine the rice vinegar, sugar and salt. Microwave for about 30 seconds, until sugar has dissolved. 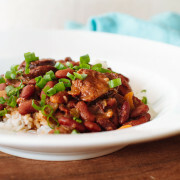 Once rice has finished cooking, place it in a large bowl and season with the vinegar mixture. 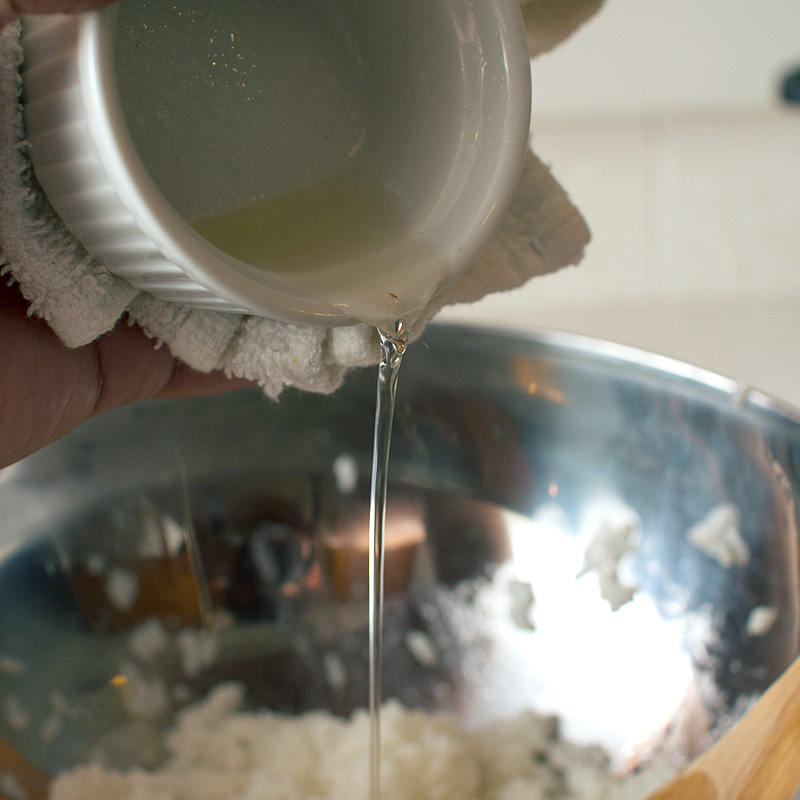 Use a wooden spoon to gently fold the vinegar into the rice to coat all of the grains, taking care not to smash any (or you’ll end up with sushi glue instead of sushi rice!). 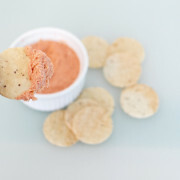 Set aside and let cool while you prep the filling. Mix tempura mix and water according to the box directions. You’ll need enough for 12 shrimp, about 3/4 cup of mix. Fry in about 1″ of oil until golden and crisp, about 5 minutes. 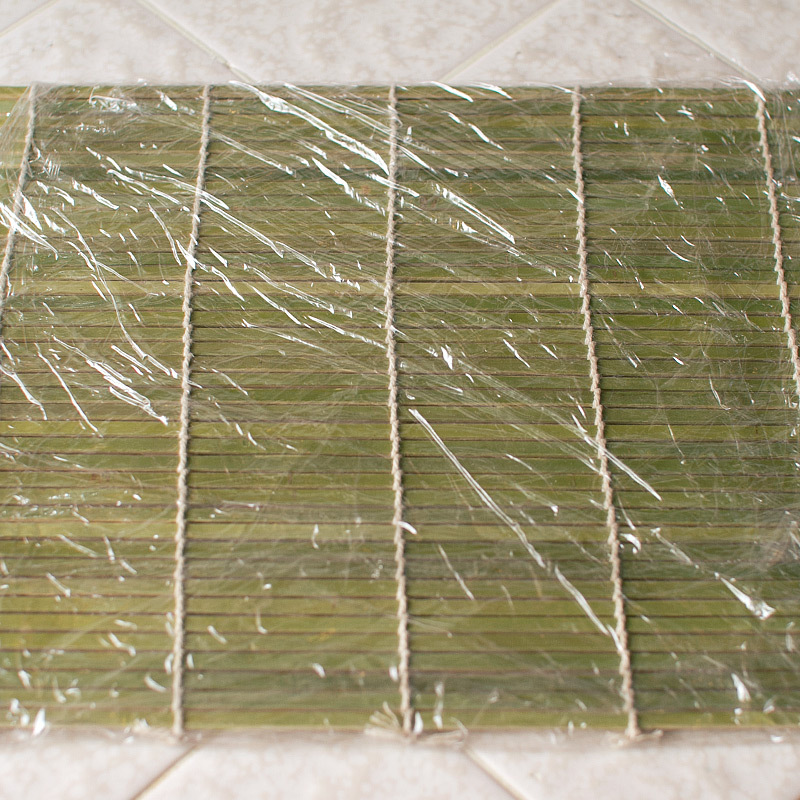 Cover a bamboo mat in plastic wrap for easy clean up. 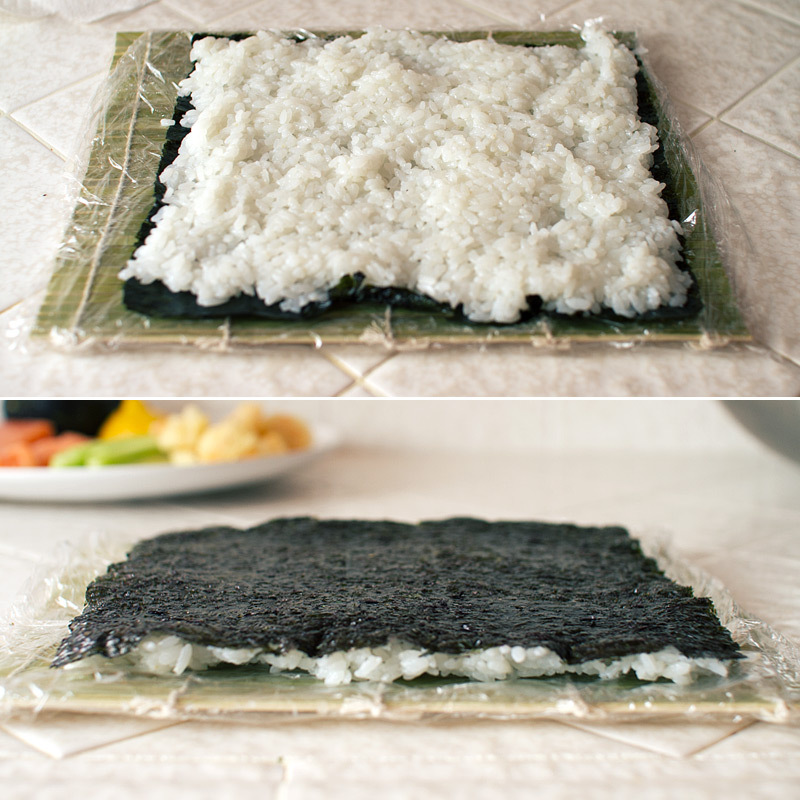 Lay one sheet of nori on the mat and, with slightly damp fingers, spread the rice evenly over the nori. The rice should be about 1/4″ thick. 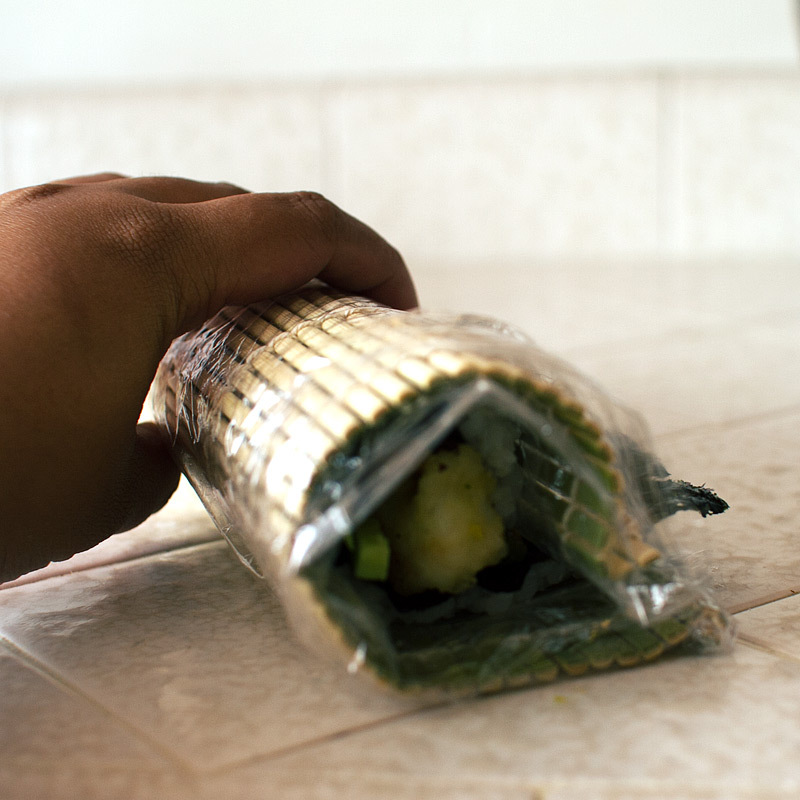 Flip the nori over, so that the rice layer is now on the bottom against the bamboo mat. 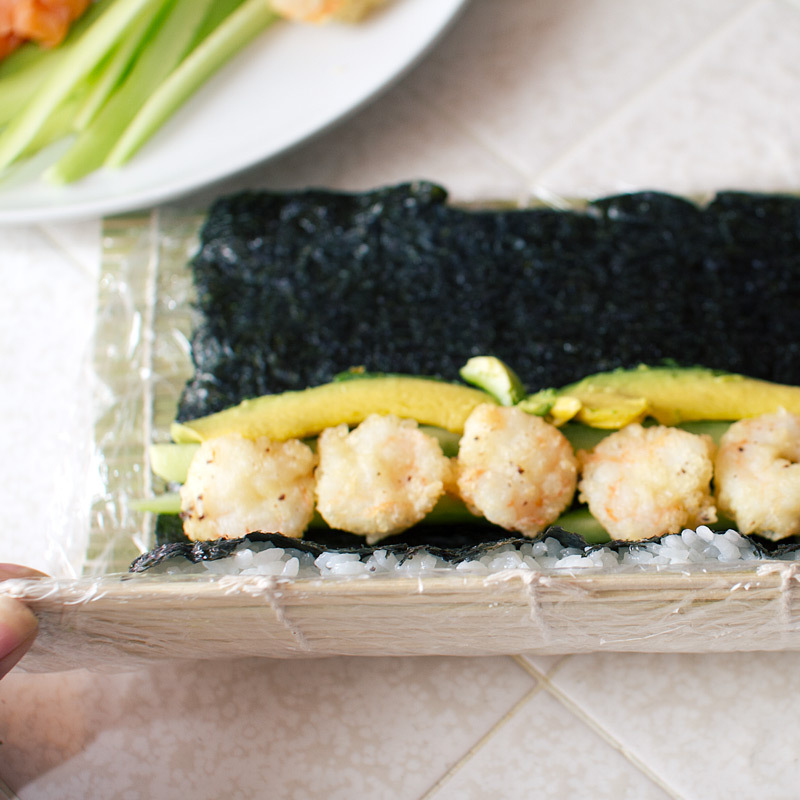 Begin to place the filling about 1″ from the edge (closest to you) of the nori, add slices of cucumber and avocado and top with 6 shrimp tempura. Lift the edge of the bamboo mat that’s closest to you and fold over the filling, continuing to tuck and roll tightly as you close the seam of the roll. Give the roll a gentle squeeze to compress all of the ingredients – this helps to make sure it doesn’t fall apart when you cut it into pieces. 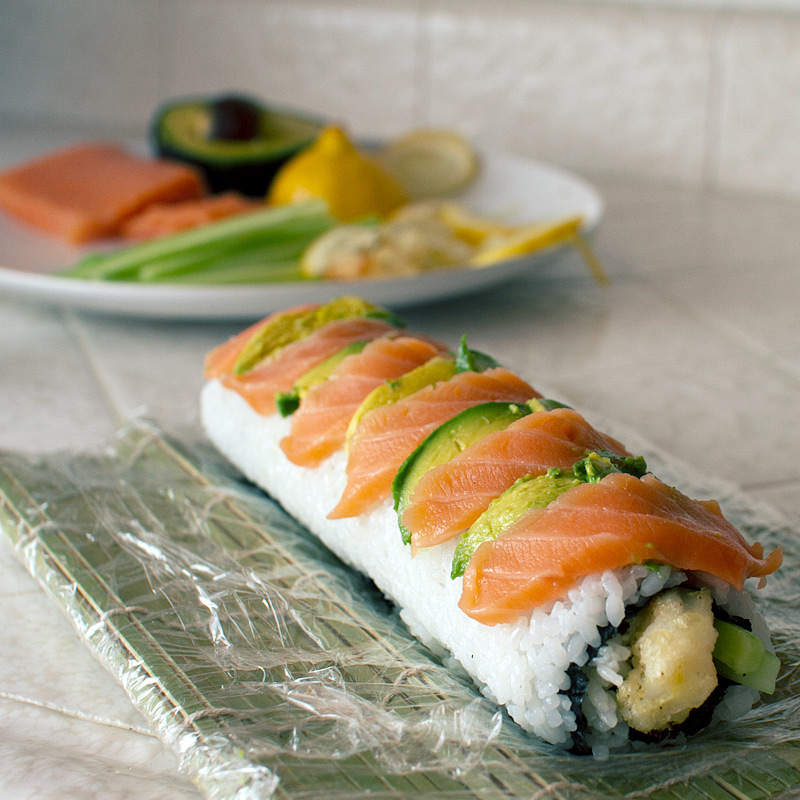 Unfold the mat and top the roll with slices of avocado and salmon. Top with lemon slices and cut into 8 even pieces. Repeat with remaining ingredients. This looks awesome. Love your step by step pictures / action shots. You should try Azuki Sushi in Banker’s Hill btw, they have amaaaazing rolls. The seared kobe beef with tempura shrimp is my favorite. But I need to check out RK, I’ve driven by it quite often but never gone in! I’ve had Azuki bookmarked forever!!! now I definitely need to go!! Not only did you make sushi. 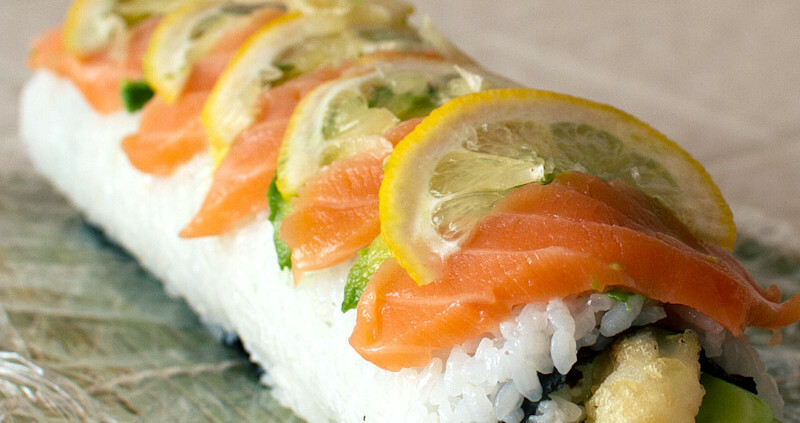 You made some damn fine, super-pretty, would-cost-$20-a-roll-at-a-sushi-bar sushi. Well done!